FREDERICK, Maryland -- The first nurse to be diagnosed with Ebola after treating an infected Liberian man at a Dallas hospital walked gingerly down the stairs of an executive jet into a waiting ambulance at a fog-shrouded airport Thursday. Nina Pham was being transported to the National Institutes of Health Clinical Center near Washington for treatment in a specialized isolation unit. The NIH campus is in Bethesda, about 35 miles from the Frederick Municipal Airport where she arrived shortly after 10:30 p.m. EDT. The agency said staff specializing in infectious disease and critical care will treat the 26-year-old nurse at the isolation unit, one of four in the nation. Obama mulls appointing Ebola "czar"
Reporters, who were kept more than 100 yards from the plane by police, watched the patient in protective clothing exit the aircraft, helped by similarly garbed workers on the ground. The process took about 30 minutes, from the plane's landing to the ambulance's departure, escorted by police cars with flashing lights. The event in a remote corner of the airport attracted a small crowd of onlookers. Ashley King, a 23-year-old schoolteacher from nearby Walkersville, carried a large sign reading, "Get well soon, Nina." King said she wanted to "get some positive thoughts going." Officials at Texas Health Presbyterian Hospital in Dallas said Wednesday that Pham was in good condition. 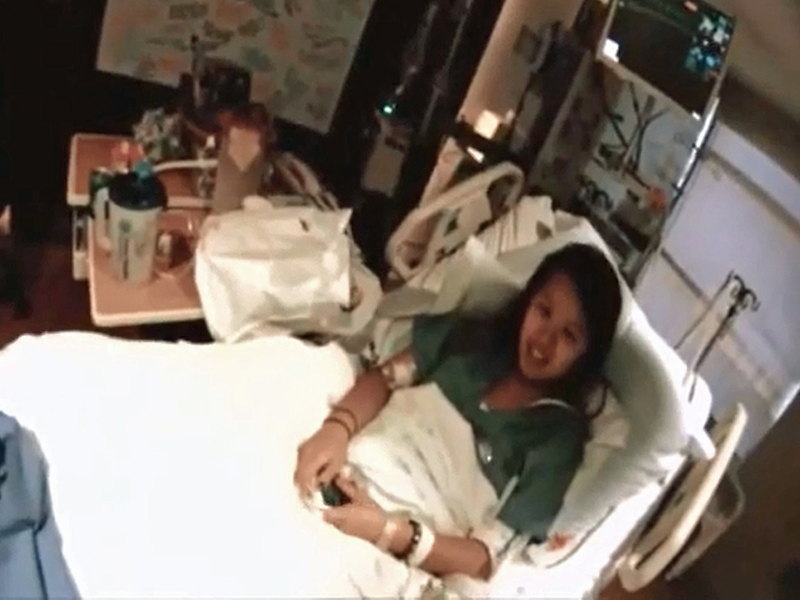 Pham was seen for the first time since her diagnosis in a video shot in her Dallas hospital room and posted online by the hospital's parent company Thursday. In the video, she smiles as she sits upright in a hospital bed while a man identified as her treating physician can be heard thanking her for getting well and being part of the volunteer team that took care of Thomas Duncan, who died of Ebola last week. "Come to Maryland. Everybody," Pham laughs into the camera before wiping away tears with a tissue handed to her by an attendant in full protective gear. Another nurse, 29-year-old Amber Joy Vinson, was also infected at the Texas Health hospital after treating Liberian Ebola victim Thomas Eric Duncan, who died on Oct. 8. Vinson was transferred from the Dallas hospital to Emory University Hospital in Atlanta on Wednesday night for further treatment. Emory is one of four U.S. hospitals with specialized isolation units to care for Ebola with less risk of spreading to health care workers. Emory has treated three other Ebola patients, two of them have recovered and been released.